The Ironstone Telecaster / Tele pickups use a mixture of Alnico V (bridge) and Alnico 3 (neck) pole pieces, giving warm, bright vintage tones. The mixed magnets and significant construction differences, mean the Tele bridge and neck have their own individual character blended with that vintage tone base. The Telecaster sound clips below give a representative sample of the tones available from this style. 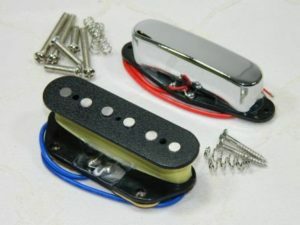 The Ironstone Tele pickup tones are not so much an artist as an era! Think classic 50's & 60's, everything from rock to blues, jazz to country. Ironstone are happy to include good quality customer's Telecaster / Tele sound clips - please just get in touch through the Contact Us page. Thanks to Paul White for some clips recorded with a Vox amp with a touch of drive. Again, thanks to Paul White for some clips with a little more drive. First verse neck pickup , second verse both and finally third verse Bridge pickup only. Two great videos from Pat Vurden over in France, stepping through the 3 way with his lefty Harley Benton TE-52 using Ironstone pickups. Full equipment list on his YouTube channel, but includes a Fender Blues Junior, with Cannabis Rex speaker and Okko Diablo Gain + Overdrive. Many Thanks Stephane. Thanks to Jim Collins for this video of him playing Harvest Moon using his Ironstone'd Surf Green Tele. Great example of the Tele tone cutting through the mix with a Strat. A video from the Basque country in Spain, thanks to Juan Gumuzio and the band Still River. Juan's playing a home built Telecaster with Ironstone pickups. The clip starts with him playing rhythm with the neck pup and then a nice bit of soloing too! And a 2013 YouTube clip of an Ironstone equipped Tele being put through its paces..